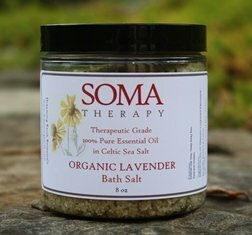 These fabulous Chamomile Aromatherapy Bath Salts are made with coarse grain Celtic sea salt (imported from France), our exquisite SomaTherapy Roman Chamomile essential oil, and dried chamomile flowers. Use for relaxing bath or foot soak. Roman Chamomile has a warm, sweet, herbaceous scent that is relaxing and calming. It is soothing to all types of skin and is a wonderful addition to bath salts.